Home > Certified Vehicles > Ford > Focus > 2018 > 2018 Ford Focus Hatchback Titanium "Certified 2.9% Finance"
This Certified Pre-Owned vehicle Comes with Finance Rates as low as 2.9% up to 72 Months and an additional year of comprehensive warranty on top of the factory 3 year 60km for no charge. 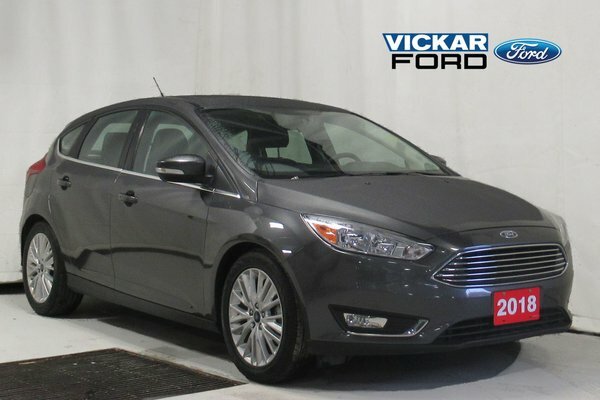 Come check out this 2018 Ford Focus Titanium 5 door hatch 5 passengers heated seats 2.0L 4GD engine 6 speed automatic transmission with a sunroof, comes with power windows, locks and mirrors, keyless entry, bluetooth capable AM/FM/MP3 single CD sirius satellite radio with 6 month subscription and reverse camera system and reverse snsing system, and more, wont last long on our lot at Vickar Ford 2000 Main Street, come down go for a test drive and enter win a car for free today. Want to try the 2018 Ford Focus Hatchback Titanium "Certified 2.9% Finance" ?